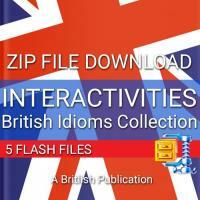 This is a collection of 5 Interactivities which will provide you with many hours of activities to improve your English. The collection includes the following flash files. The Interactivities with links go with the video English lessons that you can watch on my YouTube channel. To make sure you can use these flash files, please download the free Test File and open it on your computer. If you are able to play it, you will be able to use all of the 5 Interactivities included in this pack. Size of download is 15 MB. I am an English teacher and I want to teach English. I want to teach English and I want my high-quality English learning material to reach as many students as possible, regardless of their financial situation. For this reason, I decided to adopt a Pay What You Want (PWYW) pricing structure for all of my downloadable English teaching material sold on this site. Enter an amount below to Pay What You Want. Enter only the number and not the € sign. We do not use third-party advertising companies to serve ads when you visit this website. Britlish is an ad-free zone! Nor do we use Google or other third-party tracking code to track your movements. Cookies are small files that the pages of some sites, like this one, need to work correctly. Site operators governed by European law are required to tell users that cookies are being used. At Britlish, you need to use these cookies for the site to work as designed. You can block cookies using your browser settings, but you will find that the pages you want to use will no longer work. Cancellations apply to students who pay for Private Online Classes or Self-Study Courses through Britlish. You can cancel a booked class by using the automatic cancellation feature of the booking calendar. This is available to you as soon as you book your classes and full instructions are provided. You must cancel any booked class at least 24 hours before the start time (Teacher Time). If you do not give at least 24 hours' notice of cancellation of a booked class, it will be deemed a missed class and the minutes booked will be deducted from your account as if you had taken the class. If you give more than 24 hours' notice, the minutes booked will not be lost and you are free to use them when you wish. If you miss a class for any reason, without giving 24 hours' advance warning, you will lose the minutes that would have been used if you had taken the class. An Introductory Class time and date must be agreed between you and me before the class. I will confirm this by email. Students must make every effort to attend the Introductory Class at the agreed time and date. If a student fails to take the class at the agreed time and date, another date may be offered. The student must agree to this second offer of a class time and date. This will be confirmed by email. Students must make every effort to attend the Introductory Class at the second agreed time and date. If a student fails to take the Introductory Class at the second agreed time and date, no further class times or dates will be offered. No refunds will be given. However, depending on the circumstances, I may, at my discretion, reschedule the Introductory Class a second time. Classes start promptly at the time booked. Classes last for as long as the student has requested, up to a maximum of 2 hours - 120 minutes. If you attend class late, the class will nevertheless have begun from the booked time. If you are more than 15 minutes late for the class, the class will not be started and will be considered to be missed. The fee charged for the Introductory Class is non-refundable after 7 days from purchase. Any refund given will less payment processing fees. Introductory classes can be booked up to six months from the time and date of purchase. As full-price minutes are valid for 365 days, refunds will be considered up to 7 days after purchase. If you are not completely satisfied with your classes, and paid the full price for your classes, that is for minutes valid for the full 365 days, you can have a refund for any remaining minutes bought within 7 days of your first purchase. After 7 days have passed, no refund will be given. Any refund given will be of remaining minutes less payment processing fees. As discounted minutes are only valid for 30 days, no refund will be given once the first class has been taken. Group Captain, Wing Commander, Squadron Leader, Airman memberships, and any other kind of membership offered are non-refundable due to the nature of digital products. You are responsible for ensuring that you have a fast enough Internet connection, working headphones or speakers, and a working microphone at the time of your booked class. A webcam is optional. If you cannot take your class because of problems with your equipment or Internet connection, the class will be classed as missed and all booked minutes will be deducted from your account. If I am unable to give your class at the booked time for any reason beyond my control, you can use the minutes to book a new class at a time and date to suit you. However, no refunds will be given. How Long are Your Bought Minutes Valid For? Any standard minutes are valid for 12 months from the date of purchase. Special offer minutes are valid for a period of 1 month (30 days) from the date you book your first class after purchase as stated at the time of purchase, or for the number of days indicated at the time of purchase. Expired mintues will be removed from a students account without prior notice. It is up to the student to make sure that they use the minutes that they have paid for in the time allowed. During periods of public holidays in Spain, such as Christmas and Easter, and on any other normal working day on which I am not available, an equivalent number of days will be added to the 30 day expiry period of a student's purchased classes covering such a period. This is to ensure that, in the interests of fairness, students always have a minimum of 30 days available over which to book their classes. These additional days will only be added for days which I am not available, and will no time will be added for holidays of days off that a student chooses to take. Can I give my unused minutes to someone else? Minutes are not transferable between different student accounts and can only be used by the student to whose account the minutes were added. Students must give 24-hours notice when booking classes and all classes must be booked through the student class booking form. Any classes requested with less than 24-hours may well be refused. Due to the nature of downloadable digital products, refunds cannot be given. If you are genuinely disappointed in any digital product you have bought, please let me know as soon as possible and I will work with you to see how best we can satisfy your expectations. Britlish is the trading name of Richard Ian Chalmers. This license shall automatically terminate if you violate any of these restrictions and may be terminated by Britlish at any time. Upon terminating your viewing of these materials or upon the termination of this license, you must destroy any downloaded materials in your possession whether in electronic or printed format. The materials on Britlish's web site are provided "as is". Britlish makes no warranties, expressed or implied, and hereby disclaims and negates all other warranties, including without limitation, implied warranties or conditions of merchantability, fitness for a particular purpose, or non-infringement of intellectual property or other violation of rights. Further, Britlish does not warrant or make any representations concerning the accuracy, likely results, or reliability of the use of the materials on its Internet web site or otherwise relating to such materials or on any sites linked to this site. In no event shall Britlish or its suppliers be liable for any damages (including, without limitation, damages for loss of data or profit, or due to business interruption,) arising out of the use or inability to use the materials on Britlish's Internet site, even if Britlish or a Britlish authorized representative has been notified orally or in writing of the possibility of such damage. Because some jurisdictions do not allow limitations on implied warranties, or limitations of liability for consequential or incidental damages, these limitations may not apply to you. The materials appearing on Britlish's web site could include technical, typographical, or photographic errors. Britlish does not warrant that any of the materials on its web site are accurate, complete, or current. Britlish may make changes to the materials contained on its web site at any time without notice. Britlish does not, however, make any commitment to update the materials. Britlish has not reviewed all of the sites linked to its Internet web site and is not responsible for the contents of any such linked site. The inclusion of any link does not imply endorsement by Britlish of the site. Use of any such linked web site is at the user's own risk. Any claim relating to Britlish's web site shall be governed by the laws of the State of Seville, Spain without regard to its conflict of law provisions.